This Cinnamon Swirl Coffee Cake comes from the annals of thedomesticdiva.org. I ran across her blog and really enjoyed reading about her, her kitchen capers and best of all, her love of food (preparing it, but not eating it). That, in and of itself, is a lesson worth learning. 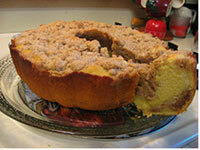 So here's wishing you baking success as you try preparing this cinnamon swirl coffee cake! Let us know how it came out! Grease and flour a bundt pan). Mix all the wet ingredients together then incorporate the dry ingredients one at a time. Mix topping ingredients together until crumbly. Sprinkle on the top of the batter in the bundt pan.